Since radio and television have existed, they have come with a programme guide. It showed customers which programme will be broadcast when. These programme guides became more and more important when the number of channels and programmes increased. So-called EPG’s (Electronic Program Guides) helped customers to find their way through hundreds of different options. The need for an intelligent program selection system has increased even more since linear programming has been supplemented by catch-up television and video-on-demand services. From a viewer point of view, these services have established a completely new content consumption landscape. In principle, viewers are now free to consume any content at any time. But this freedom comes with the challenge of having to surf through an overwhelming amount of different formats and content items. For instance, Germany’s international broadcaster Deutsche Welle, one of the project partners, produces a weekly audio and video on-demand output of 100 hours in 30 languages, 17 hours in English alone. From a content provider’s point of view, the new on-demand services have increased the challenge to stick out and make its content visible to potential customers. And also, even when they have caught the attention of the audience, content providers are faced with the additional challenge to create an ‘audience flow’ that keeps customers within their sphere and makes them watch as much of their content as possible. In order to achieve this (and also to support the consumers), a number of recommendation engines have been developed that aim for selecting and recommending content that is relevant for the individual viewer in his or her very specific situation and state of mind. The MixedEmotions consortium has decided to add emotion analysis to recommendation services. Given the fact that media consumption is very much driven by emotions, we will develop a solution that will analyse emotions in order to improve the recommendation of on-demand and live content to individual users. We intend to showcase this approach via an AppleTV application. The idea is pretty straight forward. Just after a viewer has watched a particular video, the AppleTV application will suggest a number of videos that the user could also be interested in. Within the course of the MixedEmotions project, we plan to explore the possibility of further detailing the list of recommendations by suggesting particularly joyful content on the one hand and more ambitious and intriguing content on the other hand. This additional feature depends on the quality of emotion analysis and our capability to connect specific emotions with the categories “joyful” and “intriguing”. Let’s look at the underlying data processing pipeline. We will use the Deutsche Welle media repository in order to develop and showcase our solution. The platform would have the capability of identifying emotional patterns in the content (the video) itself, but we are unsure about the usefulness of such analysis as actual news content is usually presented in a rather neutral way. 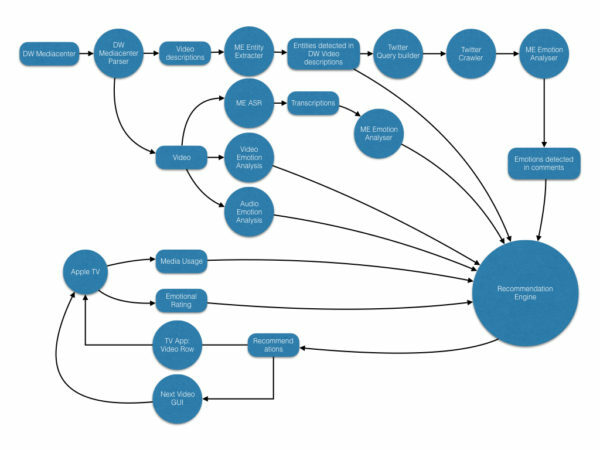 As a consequence, we intend to analyse the buzz in social networks around the topics that are covered by the video. This approach enables us to identify the dominating emotions at the moment of media usage rather than at the moment of media production. The following figure illustrates the procedure described above. The process starts with video metadata which is extracted from Deutsche Welle’s media center API. The video descriptions are analysed for semantic entities which in turn are used to form queries for searches on Twitter. The emotional content of the returned tweets is analysed and the results are fed into the recommendation engine. In parallel, the emotions contained in the videos themselves are extracted, both from the the video and audio tracks. The results are also fed to the recommendation engine. 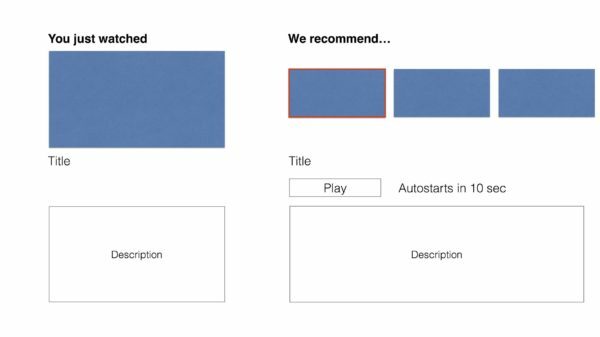 Of course, the recommendation engine also uses traditional signals, such as the media usage on any given Apple TV set-top-box. On the return path, the engine provides recommendations which are displayed on the TV interface. During the first year of the project, we have developed the technology to identify entities in Deutsche Welle video content and to map these entities to related tweets and posts in social networks. In addition, social media content is being analysed for emotional signals with the result that five distinctive emotions can be detected: joy, fear, anger, disgust, and sadness. We have also developed the first version of the Apple TV application which is currently subject to internal testing. 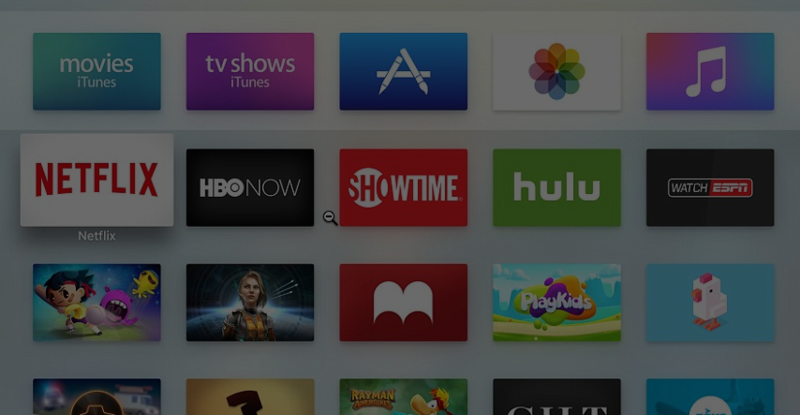 The Apple TV application is intended to be released as a beta version. The consortium is looking for beta testers! MixedEmotions is an European Research project an innovative two-year research program, which involves five companies and four European universities. With a budget of more than 3.5 million euros, it aims to search, identify, classify and characterize the emotions in large volumes and data sources by applying Big Data analysis technologies. The Deutsche Welle Innovation team is a reliable and highly experienced partner for innovation projects. Skills and know-how are diverse and range from UGC Verification to Social Media Analysis to Data Driven Journalism and Machine Translation. Special expertise includes Media Use Case development, dissemination, multimedia content provision, user interfaces and validation/evaluation. Follow us via Twitter and/or LinkedIn! ← Beyond words – What can we get from speech?